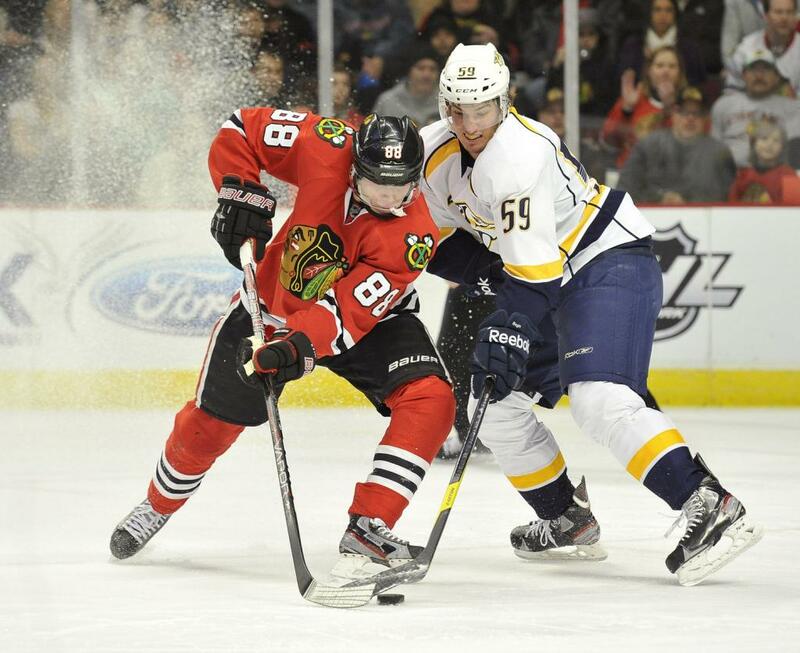 On Saturday night, the Blackhawks finished off their series with the Nashville Predators, winning the game 4-3. Duncan Keith netted the game winning score 16 minutes into the third period to put the Preds away. Jonathan Toews and Keith finished the game with a goal and two assists each. The Patricks, Kane and Sharp, each tallied a goal and an assist. Next up for the Hawks is the Minnesota Wild in the Western Conference semi-finals. On Thursday night, the Kansas City Royals and Chicago White Sox exchanged blows in what turned out to be a very interesting scuffle. Multiple suspensions resulted from the melee including Royal’s pitchers Yordano Ventura (7 games), Edinson Volquez (5 games) Kelvin Herrera (2 games), centerfielder Lorenzo Cain (2 games), and White Sox’s pitchers Chris Sale and Jeff Samardzija (5 games). The most notable person involved in the altercation is Ventura, who is just weeks off of instigating another incident with the Oakland Athletics. Ventura and the Royals have always been considered a feisty, fiery bunch. However, this angst seems to be spilling over onto the field. As the Bulls strive to win their ongoing series against the Milwaukee Bucks, one thing becomes readily apparent: Jimmy Butler is the man. Butler, who is a free agent at the end of the season, is averaging career highs points per game (28.3), assists per game (3.0), steals per game (1.8), field goal percentage (.543), and three point percentage (.393). Regardless of what happens during the rest of the playoffs, Butler has cemented his place as the Bulls’ new franchise cornerstone. After giving up three goals in the first period during Saturday’s Game 6 win, Joel Quenneville opted to pull playoff hero Scott Darling for embattled former-starter Corey Crawford. 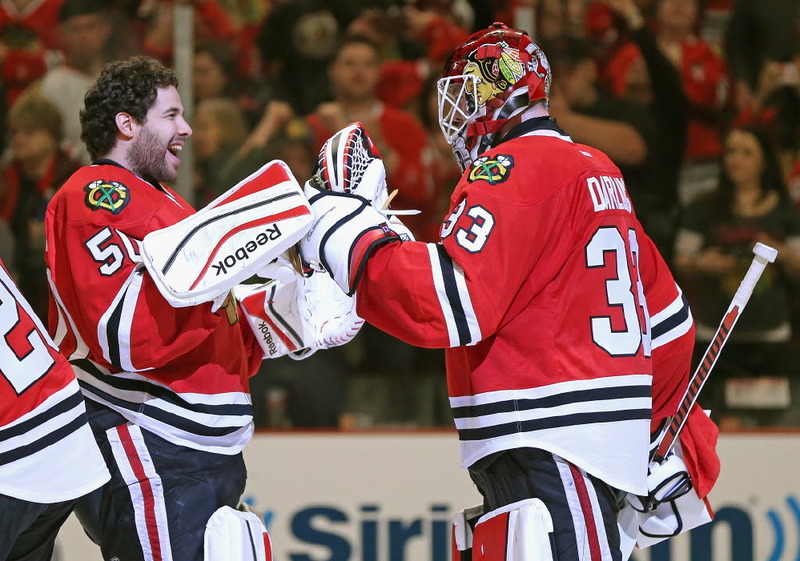 The results were instantaneous: Crawford shut-out the Predators the rest of the game, and the Hawks won because of it. No starter has been named for Game 1, but in my opinion, Quenneville should stick with the hot hand in Crawford, but Darling should be ready to play at a moment’s notice. It’s better to have two solid goalies than one terrible one. 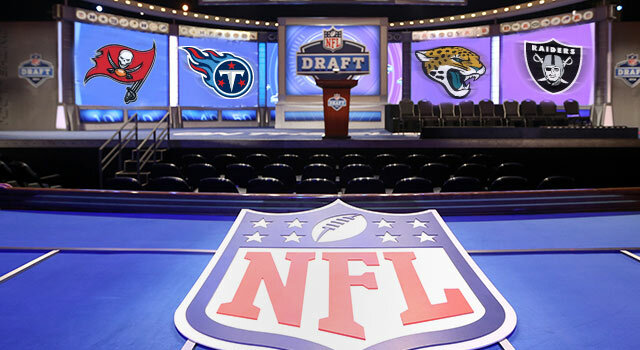 This Thursday marks the beginning of the NFL Draft. For the first time since 1965, the draft will be held in the city of Chicago. This draft proves to be equal parts exciting and mystifying. Aside from Florida State quarterback Jameis Winston going first overall to the Tampa Bay Buccaneers, the rest of the draft is unknown. Where will Marcus Mariota be selected? Will there be any blockbuster trades? The only thing that is for sure, is that Thursday night will be one hell of a night. With last night’s debut of 21-year old Addison Russell, Cubs’ faithful are getting a tantalizing preview into what may become a juggernaut in the making. Aside from possessing the greatest name for a Cubs’ player to have (his name is Addison – that’s like the Knick’s new starting point guard being named Madison), the middle infielder has burned through the Cub’s minor league system like a California wildfire during a drought. If he had moved through the system any faster, he would have to change his name to Kris Bryant. Speaking of Bryant, he has done a very nice job since is first at bat versus James Shields. He is now hitting 8-18 (.444 BA) with 3 doubles and 6 RBIS. He hasn’t hit a homerun yet, but I doubt he’ll have trouble in that department. The emergence of these two super-prospects, plus the continual success of Jorge Soler, lead many fans to be excited not only for this season, but the seasons to follow. Why, if the team is succeeding in the present, are fans looking more to the future than ever before? With a bevy of incoming top prospects many, including myself, believe that we are witnessing the makings of dynasty. For the non-believers out there, here are a few reasons that might be the case. Even with Bryant and Russell playing for the big league team, the Cubs still have a lot of fine prospects available down on the farm. Catcher Kyle Schwarber, the team’s first pick (fourth overall) in 2014, has hit 19 homeruns and 56 RBIs in only 81 minor league games. It doesn’t matter if he can stay behind the plate (it would help), the dude can flat out hit. C.J. Edwards was one of the pieces in the now famous Matt Garza trade with the Texas Rangers. At the age of 23, Edwards has already struck out over 300 batters without even pitching 250 innings. Durability concerns aside, Edwards has the repertoire to produce in the big leagues. These two prospects are just the tip of a supremely talented iceberg. Billy McKinney, a throw-in player in the Jeff Samardzija trade, looks like a Matt Carpenter clone. Albert Almora, the sixth overall pick in 2012, looks like a rich man’s Johnny Damon. Players like Duane Underwood, Gleyber Torres, Jen-Ho Tseng, Eloy Jimenez, Carson Sands, Justin Steele, and Dylan Cease, all of which are 20 years old or younger. This is discluding the prospects that are close to the major league level. Regardless of how you cut it, the Cubs are in great position for sustainable success. Another great reason the Cubs are morphing into a premier organization is the fact that the team has managed to become competitive through free agent acquisitions without hamstringing themselves finically in the future. Players like Dexter Fowler, Chris Coghlan, Chris Denorfia, Travis Wood, and Jason Motte are one-year rental players that fix major holes for the ball club. 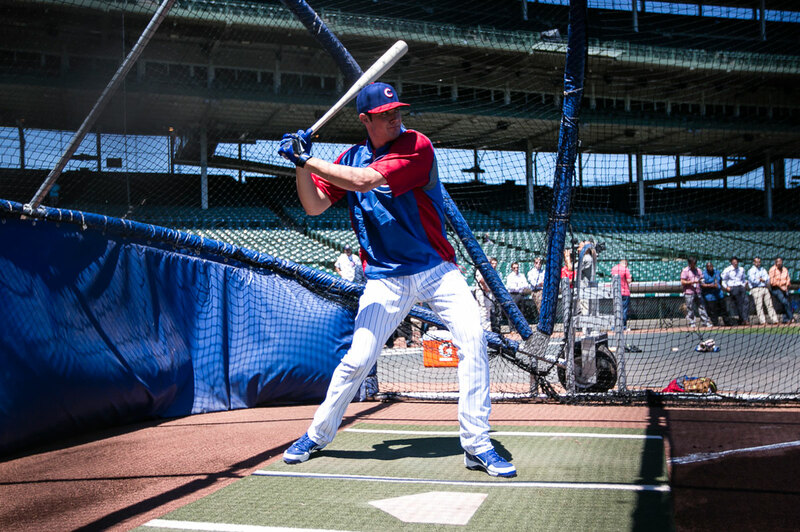 Miguel Montero, Jason Hammels, and David Ross are only around for two years, adding veteran leadership to a club that is learning how to win. In both cases, the Cubs have brought in competent players that can help bridge the gap to their top prospects. The team has only six players on the active roster that are signed through 2017, and one of them (Montero) has a club option. Theo Epstein and Jed Hoyer have done a great job of maintaining the balance between rebuilding a team, and winning now. It’s nice to have a core group of players to help build a baseball club around. The top three players in the group are Jon Lester, Anthony Rizzo, and Starlin Castro. Of the three, Lester is the only player above the age of 30. 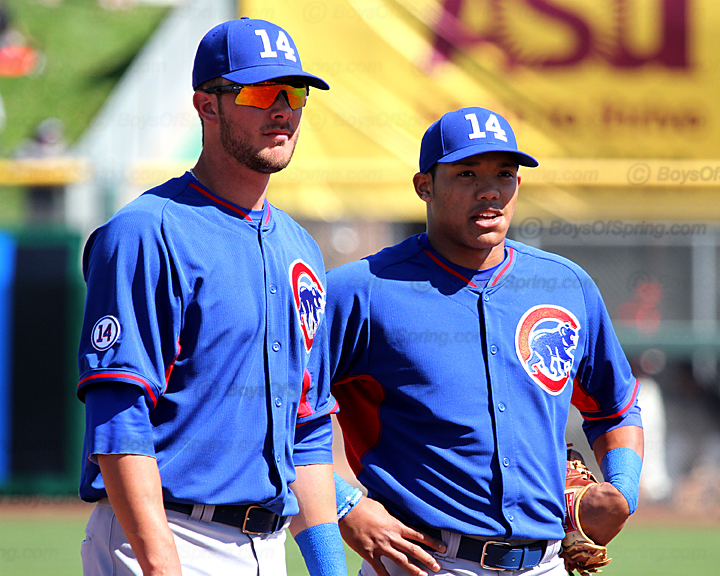 Rizzo and Catro, both age 25, represent the two longest active Cubs on the roster. Upon the hiring of Epstein and Hoyer, Rizzo was the first addition to the rebuilding franchise. 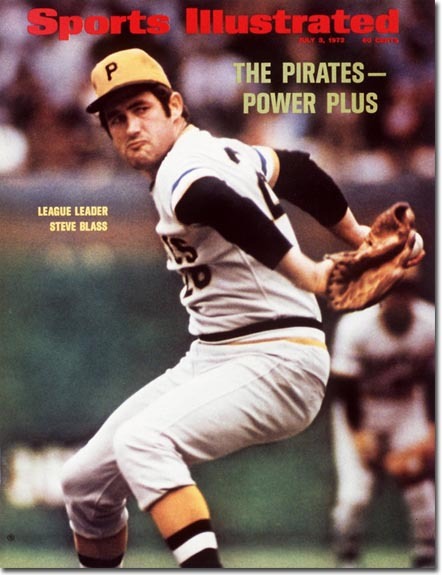 Castro, on the other hand, is the last remaining hold over from the Jim Hendry era. These two players will act as a stabilizing force for the rest of the team. With both players currently beginning their primes, the team now has two all-stars that can help them achieve legitimacy. And when both Rizzo and Castro begin their inevitable declines, players like Bryant, Soler, and Russell will be there to carry the torch that other players lit. All these reasons have the Cubs’ arrow pointing up. Theo Epstein and Jed Hoyer didn’t just create a flash in the pan, they built a machine capable of continual success, much like our bitter rivals, the St. Louis Cardinals. In essence, the Cubs are trying to become a loveable version of the Marvel Terrorist group HYRDA. “If one head is cut, another two take its place.” If Baez is a bust, Torres could be there to fill his void. If Almora is more a defensive ace rather than a table setter, McKinney has the tools needed to lead off a game. Either way, the Cubs future looks limitless. That is why “there’s always next year” doesn’t mean what it used to anymore. The biggest sporting news this weekend comes at the hand of the Chicago Blackhawks. 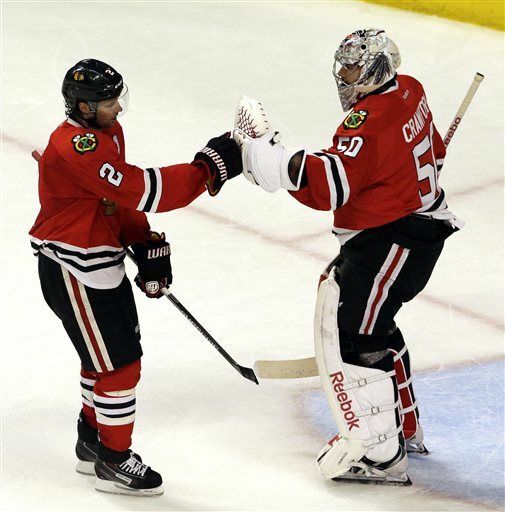 After giving up 3 goals in the 1st period of Game 1, Corey Crawford had been on thin ice with coaches and fans alike. Crawford may have fallen through after the Hawks beat the Predators Sunday, 4-2. Darling finished the day with 35 saves, adding on to his league leading save percentage (.975) and goals against average (0.94). This leaves many to wonder if this is the end of Crawford. Darling starts Game 4 tonight and in my opinion, until he falters, he should remain the starter for the remainder of the playoffs. Getting his first (and hopefully only) cup of coffee with the Cubs this past weekend, super-rookie Kris Bryant made his major league debut. Going 3 for 10, with a double and 4 strikeouts, Bryant did disappoint. However, he is too talented not to succeed. Cubs’ fans must be patient with the Phenom; he’s no Mike Trout. There will be growing pains along the way, but they will be well worth it. The Bulls also played their first playoff game this year against the Milwaukee Bucks, and an old friend came out of hiding to steal the show. Derrick Rose finished the game with 23 points and 7 assists. But it was more than what appeared in the box score for Rose, who played in his first playoff game since 2012. He dunked, nailed pull-up three pointers, and got the crowd hyped up. If he can maintain this level of play for the rest of the playoffs, Chicago may be able to topple the mighty Atlanta Hawks and Cleveland Cavaliers for the right to represent the Eastern Conference in the NBA Finals this June. Very rarely does a super-star returning from an 8-week injury get bumped down to fourth on a list of hot sports topics, but it was that type of weekend in Chicago sports. Patrick Kane is back with a vengeance, scoring 3 points in his first three games back from a broken collarbone. Now 3 points may not seem like a lot, but he is currently tied for third on the team in total points. The Hawks are getting it done as a team, and Kane has served as a catalyst for the second line. As he goes, the team goes, so it is great to see him getting back into his comfort zone. That’s all for the weekend recap. This time next week I will be covering the NFL Draft, and hopefully a handful of Bulls and Blackhawks victories. See red and let’s go Hawks! John Lester’s Yips: Is This Really a Thing? 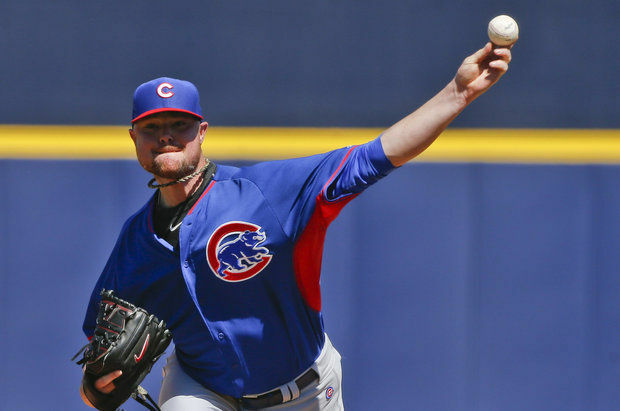 News broke yesterday that Jon Lester, the Cubs’ $155 million free agent signing/messiah, has the yips. Buster Olney, ESPN baseball insider, recently reported that Lester has been unable to throw to first base since his earliest days in the Red Sox organization. According to the report, Boston was able to hide this fact from the media by having him take fielding practice in private. The situation has been brought to light in Chicago thanks to Lester’s horrendous play in his first two games as a Cub. The Cubs do not seem too concerned by what is happening to their prized offseason addition. Joe Maddon down plays the issue. In an interview on Chicago’s 670 The Score, Maddon states, “There’s a lot of pitchers throughout Major League Baseball who aren’t that good at that.” While that may be true, none of them are making $155 million over the course of five years. None of those pitchers are expected to lead a struggling franchise to its first playoff appearance since 2008. None of those pitchers face the same pressures as Lester. There is a goddamn medical definition for the yips. This is a problem that Lester and Cubs organization should not take lightly. There have been cases where seasons and careers have been altered because of a case of the yips chronicled below. One of the more well known cases of the yips surfaced in former Twins and Yankee great Chuck Knoblauch. 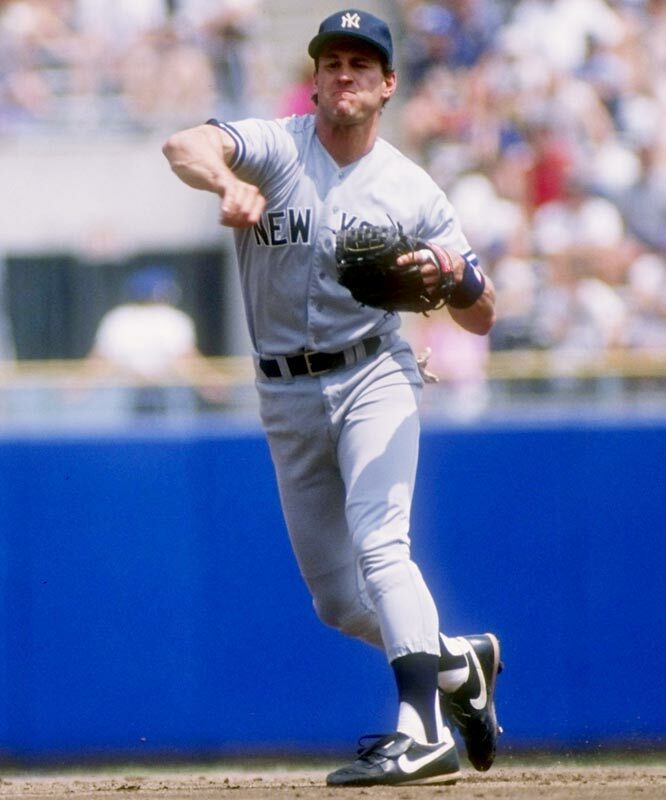 A 4-time all-star second baseman, a gold glove winner and potential hall of famer, Knoblauch was one of the driving forces behind both the Twins and Yankees World Series championships in the 1990s. In 1999, however, Knoblauch was unable to make routine throws to first base. His case of the yips was so severe that in 2000, then Yankee’s Manager, Joe Torre moved Knoblauch to left field and designated hitter. In the 2002, he left for the Royals, and in 2003, Knoblauch retired from baseball. 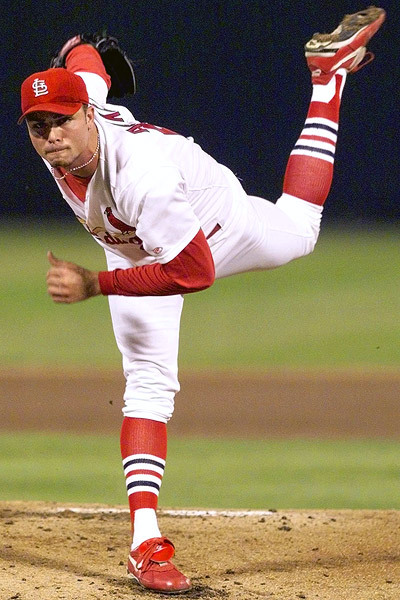 Steve Sax – who suffered from the same ailment as Knoblauch, which at the time was called “Steve Sax Syndrome” – along with Rick Ankiel, Jarrod Saltalamacchia, and Mackey Sasser are all players who have suffered from the yips. This is such a prevalent disorder that other athletes outside of the sport have suffered from it as well. John Starks, Nick Anderson, Braylon Edwards, Joel Stave, and Nick Folk all have had documented cases of the yips. I believe the Cubs and Lester should be concerned with his case of the yips. If they are not corrected soon, the North Sider’s season could deteriorate very quickly, and Lester’s career could be over sooner rather than later.